By Nina Frizoni on December 16, 2015 in Articles, Blog & Vlog! 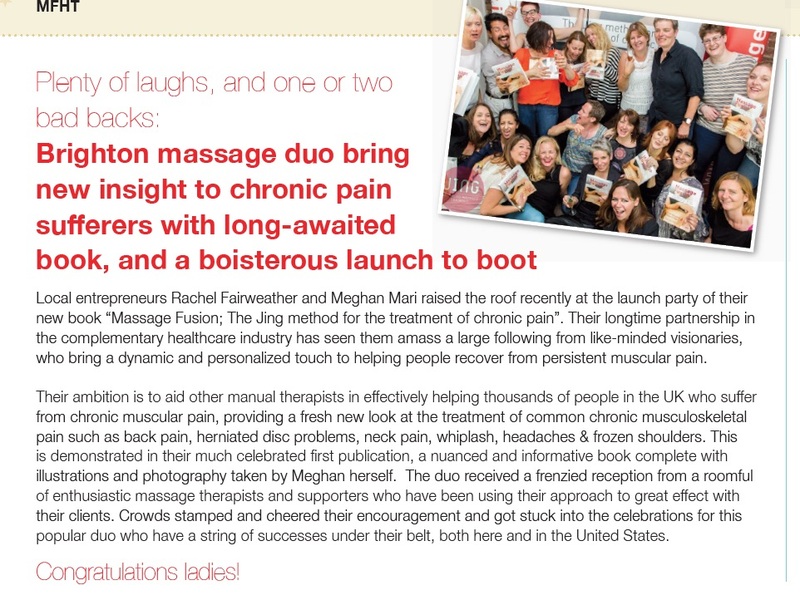 Local entrepreneurs Rachel Fairweather and Meghan Mari raised the roof recently at the launch party of their new book “Massage Fusion; The Jing method for the treatment of chronic pain”. Their longtime partnership in the complementary healthcare industry has seen them amass a large following from like-minded visionaries, who bring a dynamic and personalised touch to helping people recover from persistent muscular pain. pain such as back pain, herniated disc problems, neck pain, whiplash, headaches & frozen shoulders. This is demonstrated in their much celebrated first publication, a nuanced and informative book complete with illustrations and photography taken by Meghan herself. The duo received a frenzied reception from a roomful of enthusiastic massage therapists and supporters who have been using their approach to great effect with their clients. Crowds stamped and cheered their encouragement and got stuck into the celebrations for this popular duo who have a string of success under their belt both here and in the United States.